Explore famous Scandinavian cities and breath-taking Fjords in our signature private program. Combine itinerary with gorgeous medieval capitals of Baltic States, which are largely overlooked by international travelers, but are truly amazing. Your private driver meets you at the airport and transfers you to your centrally located hotel for check-in. After breakfast, you check out from your hotel and spend the rest of the morning at your leisure. In the afternoon your driver transfers you to the port for a ferry trip to Oslo. You spend this night on board the ferry. Optional upgrade: Copenhagen - Oslo ferry cabin class upgrade to Commodore Double Cabin or Commodore Deluxe Double Cabin (no twin beds available): $71 / $98 per person; to Commodore Single Cabin or Commodore Deluxe Single Cabin: $98 / $128 (cabin class upgrade depends on the chosen travel date). After breakfast, you arrive in the fabulous capital of Norway - Oslo. Your private driver meets you at the port and transfers you to your hotel. Upon arrival, your driver meets you at the port and transfers you to your centrally located hotel to leave your luggage. Then your guide takes you on a 3-hour walking city tour around the most magnificent attractions of the Norwegian capital. Transfer is not included. Public transport or private transfer if needed should be paid on spot. You start with a visit to one of the major Scandinavian treasures - the famous Frogner Park informally known as the Vigeland Park, named after its founder Gustav Vigeland. You spend some great time strolling through this beautiful park and enjoying its extravagant sculptures and unique Scandinavian nature. Then you proceed to other Oslo's attractions, including the Royal Palace (from the outside) and the Akershus fortress (no entrances included). Following breakfast, you check out from your hotel and walk to the train station (easily accessible by foot), where you board a train that takes you to an unforgettable Oslo - Myrdal - Flam rail ride. This trip is a perfect chance to admire the mind-boggling nature and picture-postcard scenery of Norway. Optional upgrade: Oslo - Myrdal train class upgrade (Comfort class): $18 per person. Note: upgrade is unavailable for Myrdal - Flam leg. Upon arrival, you walk to your hotel and have the rest of the day free. If accommodation in Flam is completely sold out alternative accommodation in Aurland or Gudvangen will be provided. After breakfast, you check out from your hotel and spend the rest of the morning at your leisure. In the afternoon you walk to the pier (easily accessible by foot) to enjoy a 5,5-hour express boat trip from Flam to Bergen - the second largest city in Norway. This is a wonderful experience definitely worth trying! Upon arrival, you walk to your hotel located very close to the boat station. The rest of the day is free. Please note: the best time to travel: April 1 - September 30. During Midseason, the ferry will be replaced by a Flam - Myrdal - Bergen train, as the ferry does not operate from October to March. Following breakfast, you meet your guide at the hotel lobby and enjoy a 3-hour walking city tour around the most interesting sights of Bergen. During the tour, you take a walk at the famous Bryggen district, visit the Fish Market and experience a fantastic Floibanen funicular ride that is one of Norway's best-known attractions. After the tour, you return to your hotel and have the rest of the day free. You may join a carefully designed optional tour. Today you check out from your hotel and your driver transfers you to the airport for your flight to the magnificent capital of Sweden - Stockholm. Upon arrival, your driver meets you at the airport and transfers you to your centrally located hotel. The rest of the day is free to start exploring Stockholm attractions on your own, dine in a local restaurant or take a good rest in your comfortable room. After breakfast, you meet your guide and enjoy a 3-hour walking city tour around the most interesting attractions of Stockholm. Transfer is not included. Public transport or private transfer if needed should be paid on spot. During the tour, you explore the brilliant Old Town that is one of the biggest and most well-preserved medieval Old Towns in Europe and see the famous Royal Palace, the Stockholm Cathedral and the City Hall (no entrances included). After breakfast, you check out from your hotel and spend the rest of the morning at your leisure. In the afternoon, your driver transfers you to the port for a ferry trip to Helsinki. You spend this night on board the ferry. Optional upgrade: Stockholm - Helsinki ferry cabin class upgrade to LXB Seaside Premium Double Cabin or Suite (no twin beds available): $35 or $77 / $141 per person; to LXB Seaside Premium Single Cabin or Single Suite: $64 or $157 / $279 (cabin class upgrade depends on the chosen travel date). After breakfast, you arrive in the port of Helsinki where you meet your private driver who transfers you to your centrally located hotel to leave your luggage. Then you meet your guide at the hotel lobby and go on a wonderful panoramic city tour around the most fantastic attractions of Helsinki. During the tour, you walk through the vivid Central Harbor and Market Square, explore the charming Old Town and visit the famous Rock Church and the Helsinki Cathedral. Transfer is not included. Public transport or private transfer if needed should be paid on spot. In the morning after breakfast, you meet your private guide at the hotel lobby. You are going on a wonderful 3-hour walking tour of the Old Town, during which you enjoy both Upper and Lower parts of Tallinn’s Old Town. Your tour includes visits to the Gothic style Dome Church, the Gothic Town Hall (entrance tickets are included in the price) and other remarkable places such as the Great Guild and Blackheads Fraternity Houses and the medieval pharmacy. 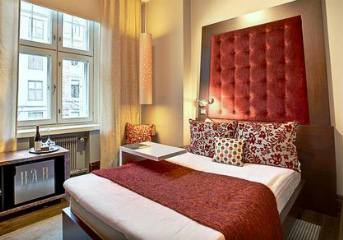 After the tour, you return to your hotel and have the evening at your leisure. In the morning you check out from your hotel and your driver transfers you to the port where you board a ferry that takes you to the beautiful capital of Estonia - Tallinn. Upon arrival, your driver meets you at the port and transfers you to your centrally located hotel to leave your luggage. Later you meet your guide at the hotel lobby and go on a wonderful 3-hour walking tour around the most magnificent attractions of Tallinn. During the tour, you explore both Upper and Lower parts of the Old Town. In the Upper Old Town you visit the Alexander Nevsky Cathedral, go inside the Dome Church and admire magnificent views of the city rooftops from the observation platform. In the Lower Old Town, you see the wonderful Town Hall Square and the Town Council's Pharmacy believed to be the oldest working pharmacy in Europe. Then you proceed to St. Catherine’s Passage that provides numerous shopping opportunities at the local craft workshops, including glass, leather, and ceramic wares, and finish the tour next to the iconic Viru Gates. After breakfast you check out from your hotel and your driver transfers you to the charming capital of Latvia - Riga in about 4,5 hours. Upon arrival you are taken to your centrally located hotel to leave your luggage. Later you meet your guide at the hotel lobby and go on a 3-hour walking city tour around the most interesting Riga attractions. During the tour you take a walk at the cobblestone streets of the Old Town, visit the Dome Cathedral and the Church of St. Peter (entrance tickets are included) and explore the heart of Riga’s Art Nouveau heritage - a famous Albert street abundant in beautiful buildings with unusual sculptures, colored bricks and tiles, geometric ornaments and uniquely shaped windows. After the tour, you return to your hotel and have the rest of the day free. Breakfast is included. This day is free for you to continue exploring the fantastic attractions of Riga on your own or take one of our carefully prepared optional tours. After breakfast, you check out from your hotel and your driver transfers you to the charming capital of Lithuania - Vilnius in about 4 hours. Upon arrival, you are taken to your centrally located hotel to leave your luggage. Later you meet your guide at the hotel lobby and go on a 3-hour walking city tour around the most fantastic Vilnius attractions. During the tour, you explore the cobblestone streets of the Old Town, visit the famous Vilnius Cathedral and go inside the oldest university in Lithuania dating back to 1579 - the Vilnius University (entrance tickets are included). This day is free for you to continue exploring the fantastic attractions of Vilnius on your own or take one of our carefully prepared optional tours, including a day trip to the Trakai Castle. Contact your travel specialist about available options. This is the last day of your amazing Scandinavian-Baltic adventure! After breakfast, you check out from your hotel and your driver transfers you to the airport for your flight back home. We wish you a safe flight and hope to work on your future trips! Not included: international flights, multiple arrival/departure transfers, other meals not mentioned in the program, optional tours and services, all personal expenses. *Note: optional tours are conducted with a minimum number of participants in order to offer lowest rates. If we don't have the minimum number of participants we will notify you in advance and suggest alternatives or the cost of the current optional tour on a private basis.